Blog Learn Chinese Is Learning Mandarin Hard? Is learning Mandarin Hard? – NO IT’S NOT! Starting to learn a new language can appear daunting. Especially when that language bares absolutely zero resemblance to your current language. For many people that is exactly the case with Chinese but it should not appear scary. Chinese is actually great fun to learn and once you start to build the pieces of the language together it starts to make a lot of sense. To help you, let’s give you a few reasons why Chinese actually isn’t as scary to learn as you might think! In fact, when you get to it you might find learning Chinese gets easier as you go along! So what are the main reasons we believe learning Chinese is not difficult…? So let’s go into detail on why Mandarin is NOT hard to learn…! So in English, French, German etc we learn the numbers, then the months and the days of the week. 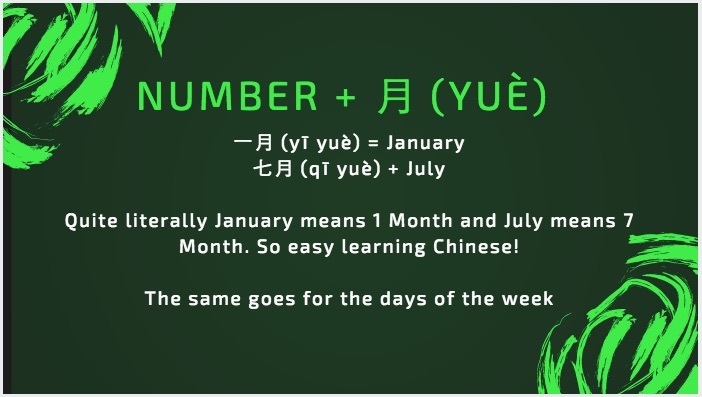 Well in Chinese once you’ve learned the numbers without even realising you will know the months and days as well. So once you’ve memorised the word yuè, and you know the numbers, you automatically know the months! Simple as that. Both xīngqī and zhōu suffice, followed by the number from 1 to 7 (1 being Monday, 5 Friday) and you have the days nailed. It may seem bizarre to mention. It’s not difficult to remember two words, right? Well Chinese natives quite often get him and her mixed up and this is worth noting if you speak to a Chinese national with a basic/intermediate level of English. They may well refer to your female friend as he, don’t be embarrassed, this is incredibly common. However, on the flip side that makes our job a much easier one. One word for both him and her, both also follow the same tone. It’s worth noting they have marginally different symbols as you’ll see above. 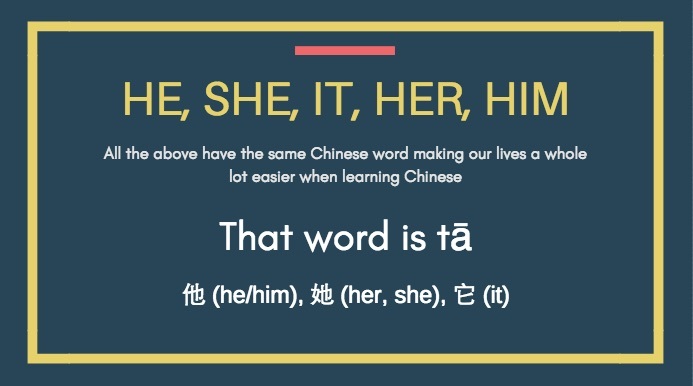 When moving into plural territory such as them you simply add on “men” to make 他们 – tāmen. 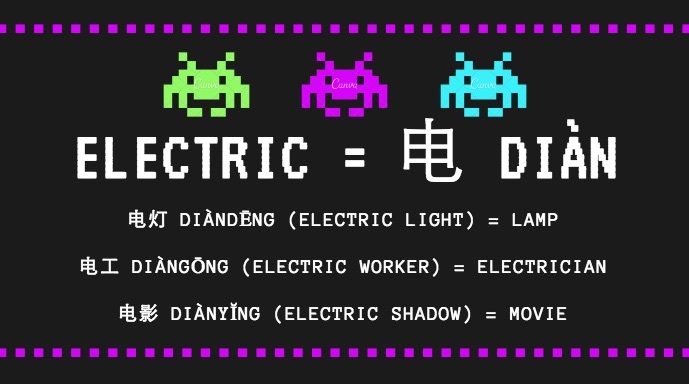 As we said before the Mandarin Language is incredible logical and there are hundreds of examples we could point towards but let’s focus on Electric. The word for Electric is 电 which is pronounced Diàn. Now you know this you can start to piece a number of words together. For example, the word for Computer literally translates to Electric Brain and the word for Movie literally translates to Electric Shadow. Although the direct translations sound bizarre, this makes learning Chinese so much easier. Just think, if you see the 电 symbol you can be confident you are reading something related to Electric. It also gives you great opportunities to remember things. If something has slipped your mind you can break it down. What is a lamp? It’s a light and it’s powered by electric. A shrewd way of building a language we think and it makes our lives much less complex and much more logical. Staring blankly at a sheet of paper full of Chinese Characters, we’ve all been there. Rather than toss the sheet of paper away, let’s take a step back and break it down a little. Although some characters do appear and look incredibly complex, every character is actually broken down into a number of more simple characters. There are also many that actually appear to look just like their actual meaning. Fire – One of our favourites is the symbol for fire which, in pinyin is spelt – huǒ. The symbol looks very much like someone running with their arms in the air as if on fire -火. This also leads us onto our next symbol which is the same but without the flailing arms! Person – So person is a simple two stroke character that effectively mimics someone walking. This symbol should not be confused with the similar looking. Is learning Mandarin hard? Not with Chineasy! As you can see above with the aid of visual drawings and illustrations it’s actually very easy to pick out some of the characters and their meanings. Tree, very much looks like a tree. Mountain likewise. Everyone has their own preferred methods of learning Chinese and there is no right or wrong answer but visual aids are a very popular way to learn and this is something most other languages around the world do no possess. Hopefully the points above give you a glimpse into what learning Chinese is actually like. Although it appears to be many mountains high, it can be broken down and you can see progress made pretty quickly if you really put your mind to it and show a determination to succeed. Immersing yourself into Chinese Culture will only enhance that ability and speed to learn the language as well. Once you get over the original fears of studying Mandarin, you’ll really find that learning Chinese is not difficult. Free Learn Chinese PDF Download – That’s right, free. Our favourite price! Learn Chinese for free with our very own LTL PDF download. 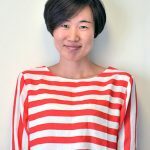 Ten fluent non-native Chinese speakers tell us how they succeeded and how to get you there, faster! Chinese Alphabet and Chinese Characters – There are so many Characters but don’t let that scare you! Learn Chinese Apps – There’s lots of these also, but which are the best? 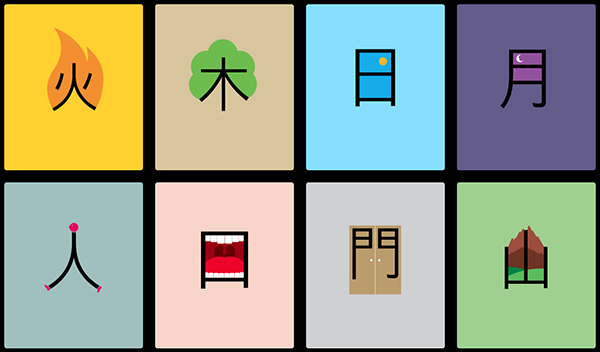 Learn Chinese using Pictures – Textbooks can get tedious, so make it more fun.